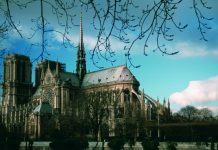 Given such reviews, and the street’s location within walking distance of the Eiffel Tower, Les Invalides and such museums as Quai Branly, the Musée d’Orsay and Musée Rodin, it’s no surprise that tourists have flocked to Rue Cler in recent years to find out what all the hubbub is about. But not every visitor comes away with a first impression as glowing as the critics’. 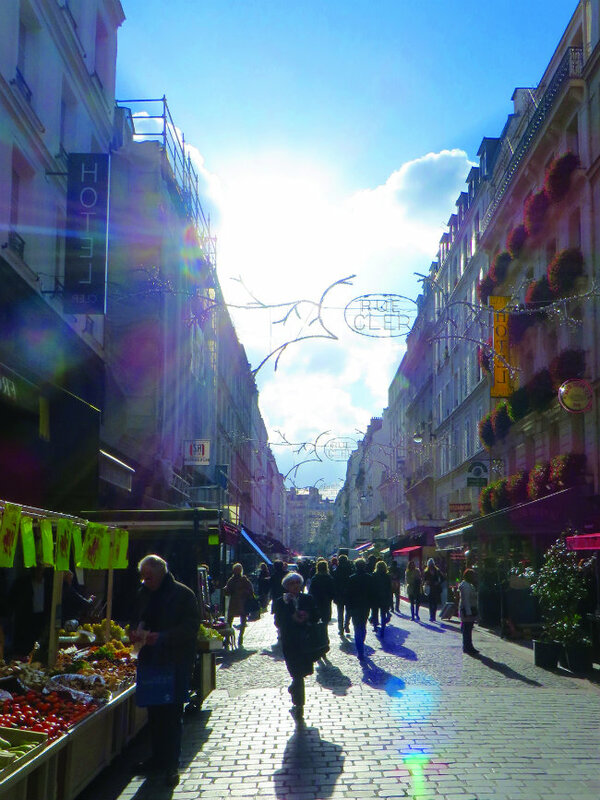 Rue Cler’s appeal isn’t as readily apparent as that of other famous Parisian shopping streets. 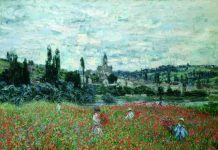 It doesn’t have the bustling activity and free spirit of Rue de Lévis, nor the vibrant history of Rue Montorgueil; it lacks the diversity and artistic flair of Rue Daguerre, the youthfulness and creative entrepreneurship of Rue des Martyrs, and the sheer scale of Rue d’Aligre. And yet this genteel market street has an identity no less distinct, marked by the exigent tastes of some of the oldest, most well-to-do families in Paris. 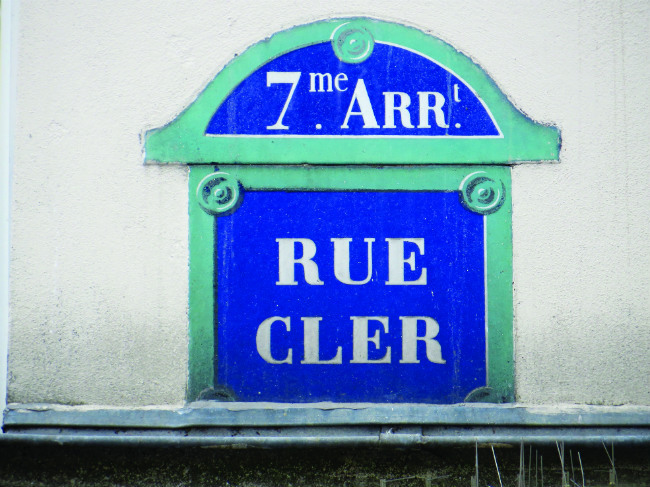 Rue Cler runs through the heart of the 7th arrondissement, an area associated with the French nobility. 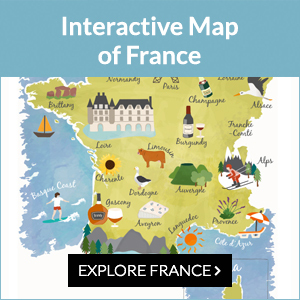 It is littered with historic mansions, many now the homes of France’s business elite, government ministries, and foreign embassies. Emanating what Le Figaro calls “the discreet charm of the bourgeoisie,” Rue Cler, like the rest of the 7th, “embodies a certain French art de vivre”. 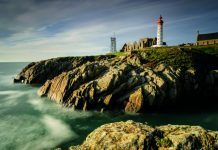 But it isn’t exactly spilling out onto the cobblestones, as some travel writers seem to suggest – it must be sought out. Rue Cler is best discovered slowly, by pushing open door after door, tasting one delicacy after another, and listening to the stories behind them, until the true scope of the street’s delights becomes deliciously evident. 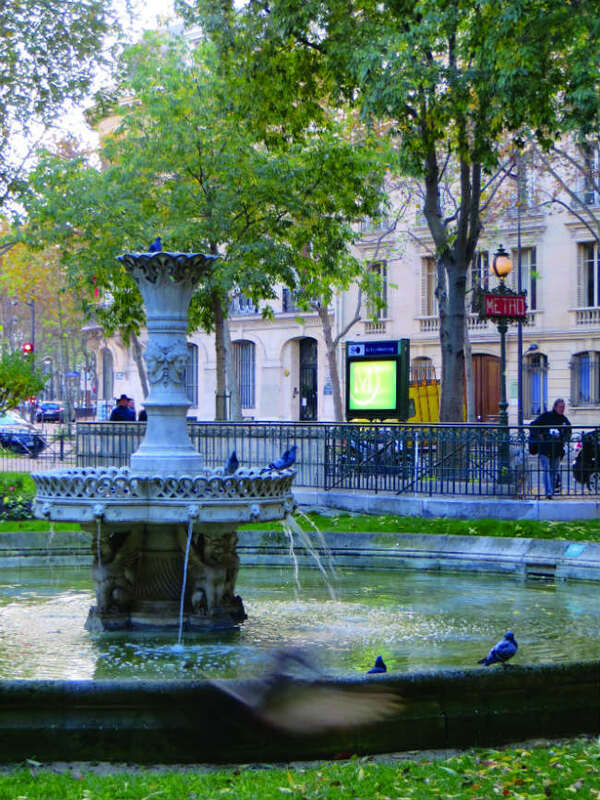 From La Tour-Maubourg metro stop, with its garden and trickling fountain overlooked by a statue of Vauban, Louis XIV’s military planner, it’s but a short walk down Rue de Grenelle to reach Rue Cler. There, to one’s left, the entrance to the pedestrian half of the street, where the lively Sunday market takes place, is flanked by two large greengrocer stands. Shoppers amble leisurely past tidy displays of vegetables, fruit and mushrooms. The produce vendors are polite and attentive, never barking out prices the way it’s done at the more riotous street markets of the Right Bank. Decades ago, the ambiance would have been quite different. Before chic cafés and clothing boutiques began to encroach in recent years, Rue Cler was awash with food. 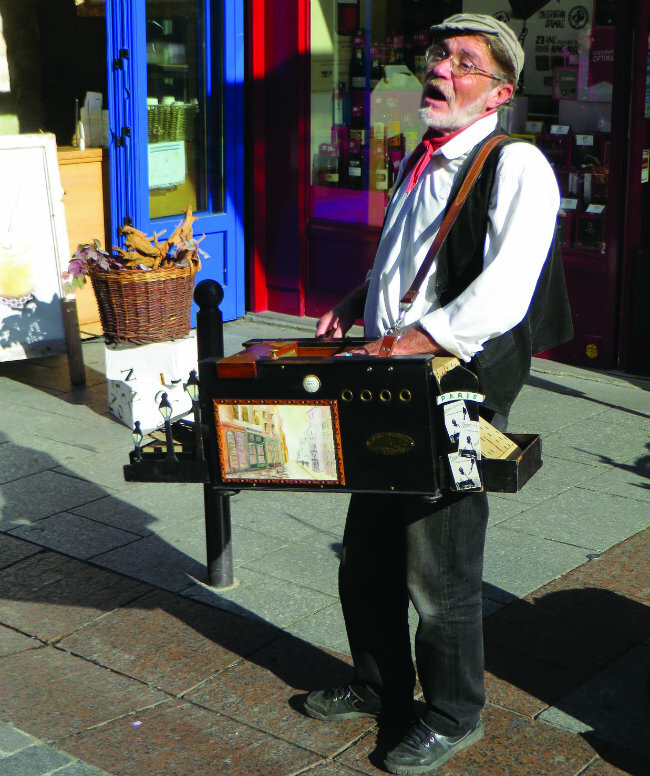 Some still recall the charrettes – produce carts – often owned by widowed wives of WWII soldiers granted a dispensation to sell their wares in the street rent-free. But as the ranks of such arduous professions have diminished, it seems the loss in quantity has been accompanied by a notable rise in quality, earning the street a sterling reputation for gastronomic excellence. That renown is what drew Yohan Lastre and Marion Sonier to open their laboratory of fine foods on the corner of Rue Cler and Rue de Grenelle. Lastre, a 37-year-old chef who has worked in such Paris institutions as the Ritz and the Tour d’Argent, received in 2012 the rare honour of being named champion du monde de pâté-croûte. French chefs have been baking meat pâtés in buttery pastry shells for centuries, but Lastre has respectfully infused the tradition with a dose of modernity, creating seafood, vegetable and fruit recipes as well. 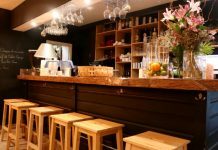 To celebrate the pâté-croûte, while offering freshly-prepared dishes and pastries to go, in September 2016 Lastre opened Lastre sans apostrophe (188 rue de Grenelle), with his cabinetmaker wife, Sonier, who designed the interior. To trace back the origins of Rue Cler’s reputation for excellence, two names stand out: Davoli and Jeusselin. 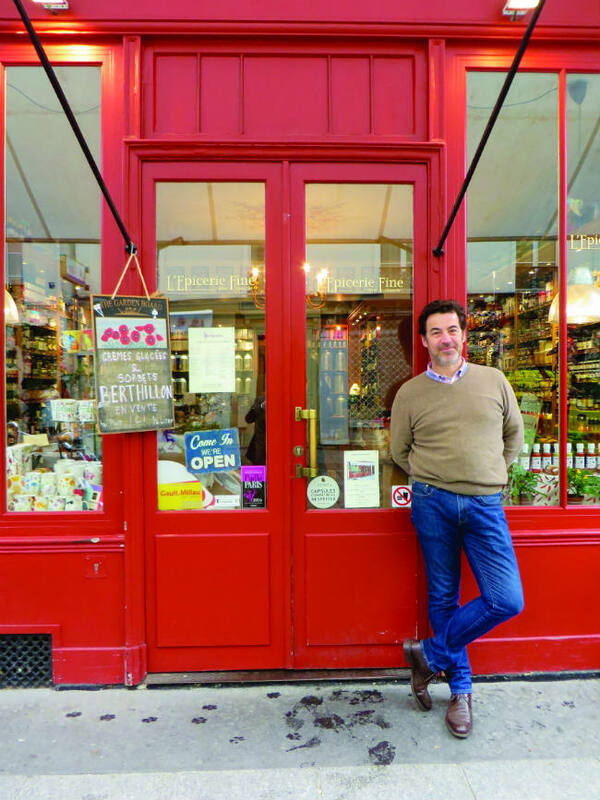 Today, Bruno Jeusselin of Maison Jeusselin (37 rue Cler) is the charcuterie/delicatessen’s third-generation owner. Following in the footsteps of his father and grandfather, who founded the business in 1937, Bruno has made fait-maison – homemade – his watchword. 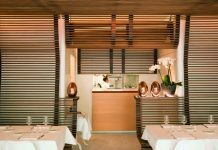 Jeusselin is now one of the last charcuteries to still prepare nearly everything they sell on site, from delicious hot dishes to their famous foie gras, their gold medal-winning fromage de tête – headcheese – and jambon blanc. For upholding such exacting standards, in 2008 the gastronomic guidebook Gault & Millau named Maison Jeusselin meilleur traiteur de Paris – the best delicatessen in Paris. 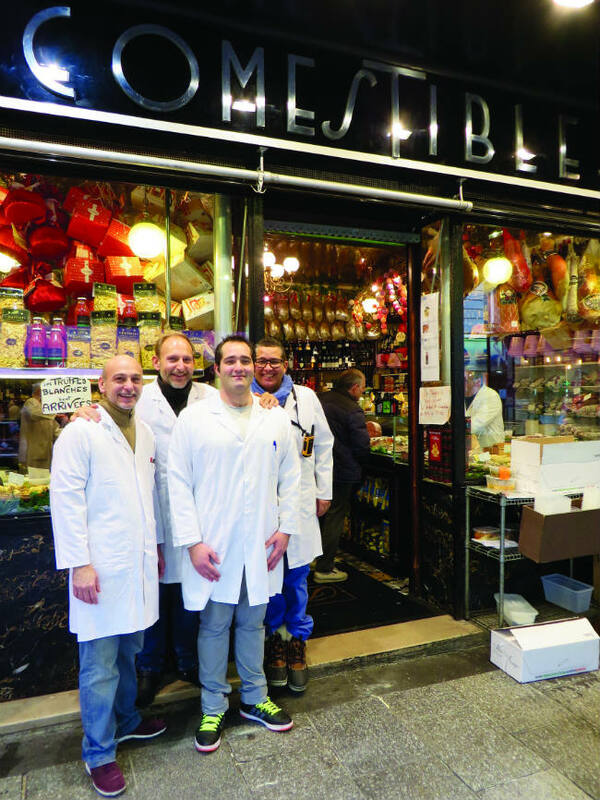 As fate would have it, for more than half a century, across the street from the best French delicatessen in Paris has stood the best Italian delicatessen in Paris. When it opened at 34 rue Cler in 1962, Davoli was already a name associated with the finest Italian charcuterie in the French capital, the business having been founded in 1913 – the original boutique was on Rue de Passy. Today, Stéphane and Alexandre Davoli are the fourth-generation owners, and their fabulous Franco-Italian delicacies are a reflection of their family’s history. The Parma hams hanging from the ceiling, as well as the aged Parmesan cheese, balsamic vinegars, olive oils and pasta, are all imported from their homeland of Emilia-Romagna. But the steaming tray of sauerkraut on the counter, like the servings of blanquette de veau and boeuf Bourguignon their clients buy to go, are reminders of generations of family culinary exchanges and intermarriages. 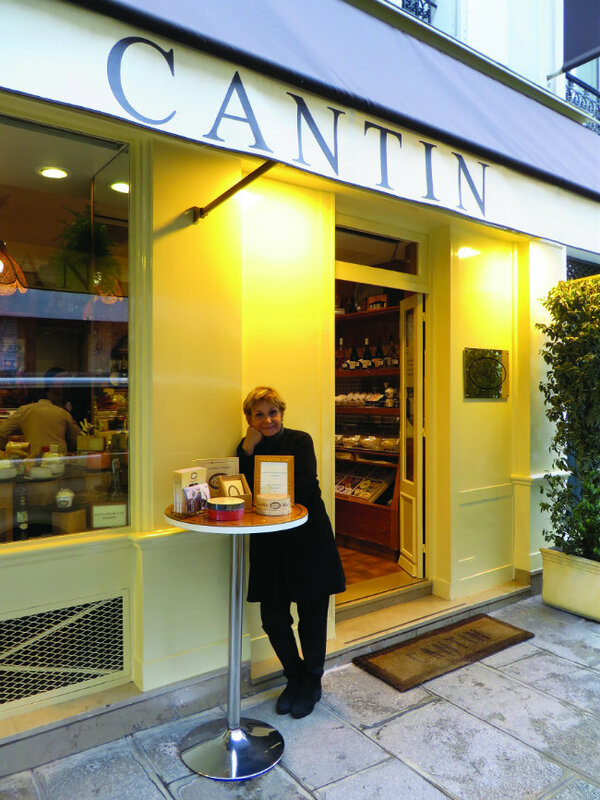 Such has been Marie-Anne Cantin’s conviction for more than 35 years at her eponymous cheese shop, around the corner at 12 rue du Champ de Mars. This second-generation cheesemonger, whose father founded the French Cheese Merchant’s Guild, has upheld the waning tradition of affinage, ageing hundreds of cheeses to their aromatic apogee in her own cellars. 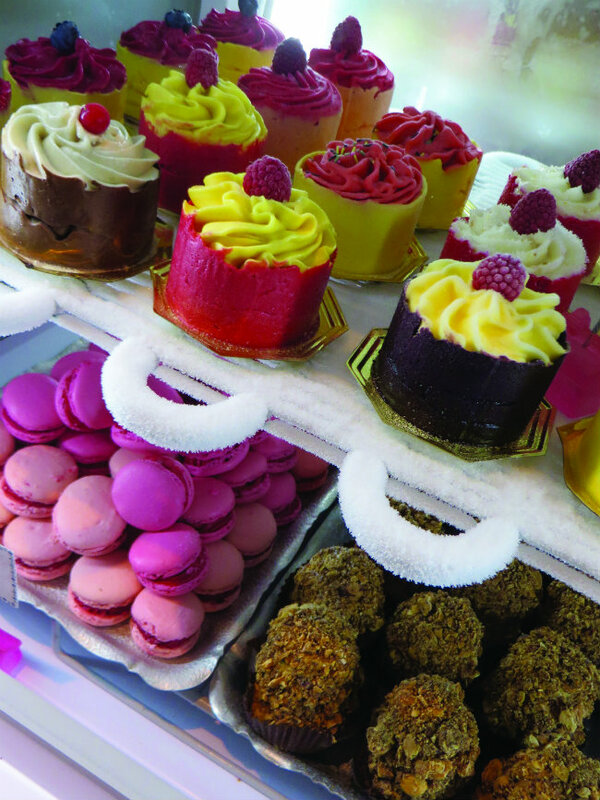 Cantin’s boutique resembles a jewellery shop more than a fromagerie, so elegant are her displays. 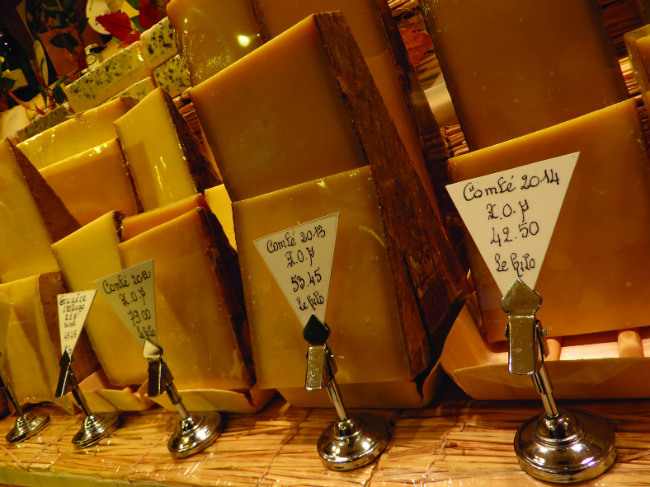 Yet, with the exception of the 48-month-aged Comté, her cheeses cost far less than diamonds. 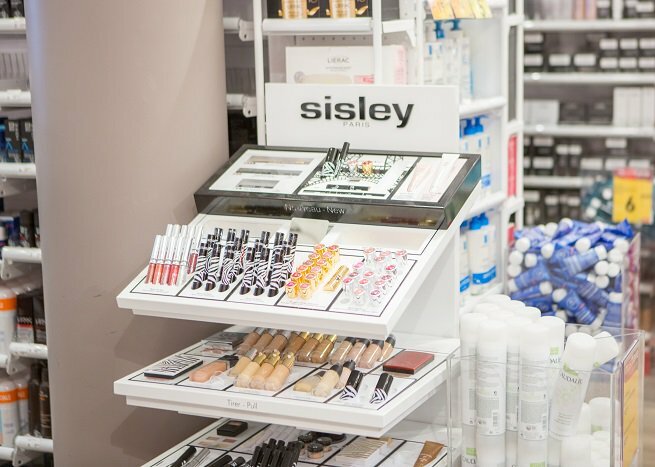 “What we offer is not a luxury, not in terms of price,” says Cantin. “It’s a luxury, though, in how rare cheeses aged to perfection have become.” She estimates that only four or five neighbourhoods in Paris still have a cheesemonger who cellars their own cheeses. For Cantin, it’s only natural that Rue Cler is one of them. 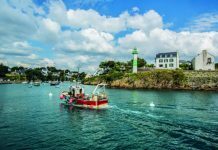 “There are several gastronomic hubs in Paris, but it’s true that in a small area around Rue Cler you have a real diversity,” she says. 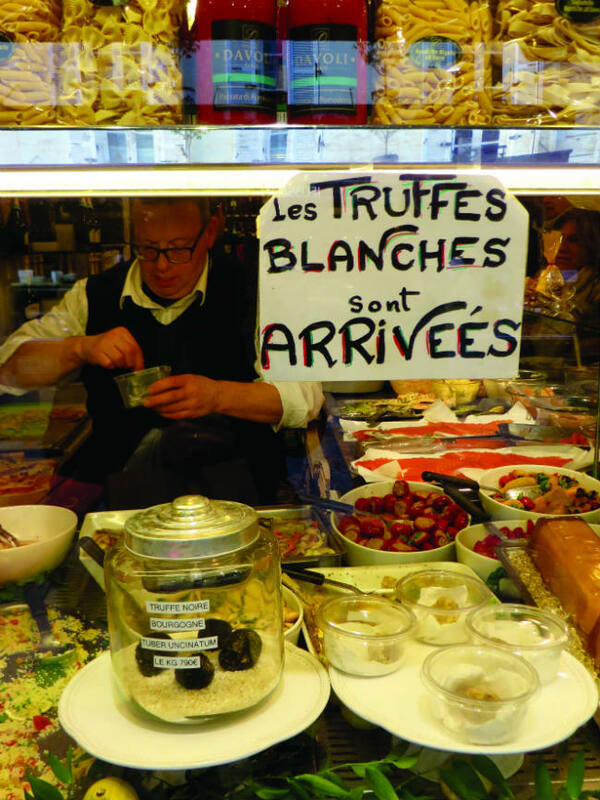 “You have our cheeses, you have Davoli and Jeusselin, and the world’s best pâté-croûte… You can find everything.” From a fine fishmonger, La Sablaise (28 rue Cler), with its enormous line-caught turbots, to the excellent Boucheries Roger Billebault (52 rue Cler), one of the rare butcher shops in Paris to offer organic meats, to the grand wine shop Les Grandes Caves (55 rue Cler), with its singular selection of rare Burgundy, Bordeaux, and Champagne cuvées to match any dish, Rue Cler can meet a gastronome’s every desire. For a sweet tooth, there’s the celebrated chocolate shop Chocolatier Pralus (44 rue Cler). 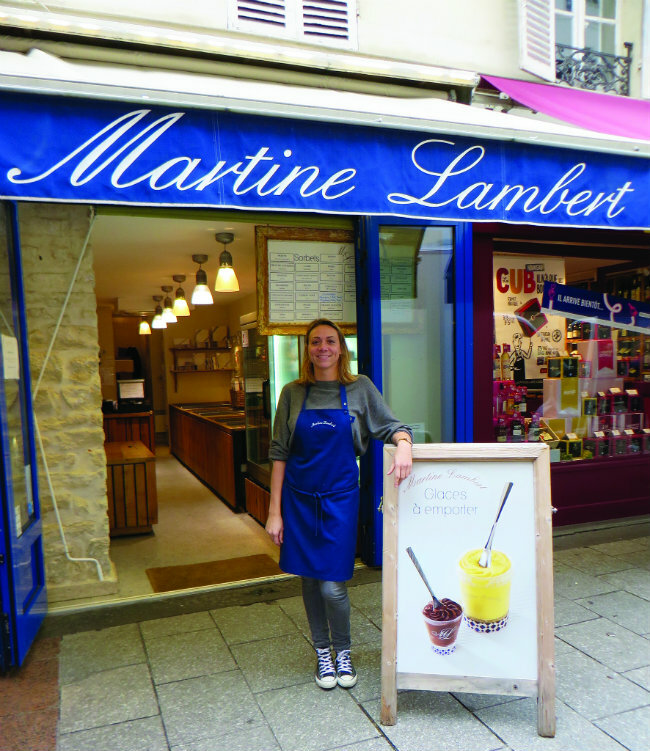 At 39 rue Cler is the only Paris outlet of Normandy’s extraordinary Martine Lambert, who fine-food expert Bruno Verjus named “la reine des glaces”– the Ice Cream Queen. 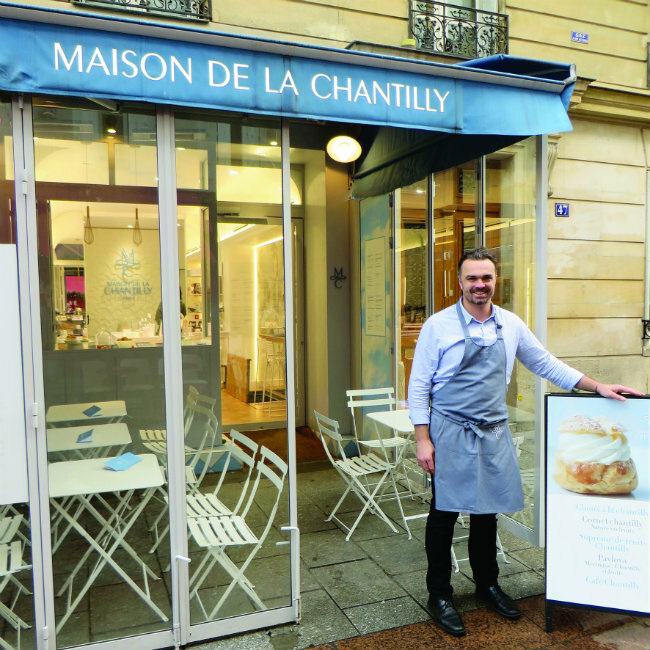 Most recently, La Maison de la Chantilly (47 rue Cler) opened its flagship boutique, dedicated to rehabilitating a legendary element of French pâtisserie much maligned by supermarket imitations: crème Chantilly, made from farm-fresh cream. 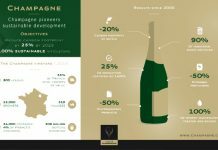 Recently, the 2017 edition of France’s Guide des Gourmands awarded Mièvre their Coq d’Or for best épicerie in Paris, noting: “At a time when anyone and everyone is opening their ‘épicerie’, that which Pascal Mièvre has owned for many a year should serve as their model.” Such words could apply to Rue Cler itself. It’s a street which cannot be judged on sight alone: to know it, it must be tasted, one delicacy after another. This Franco-Italian delicatessen’s cornucopia of delicacies reflects the splendid culinary journey of an Italian immigrant family. 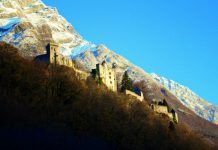 Four generations of Davolis have brought to Paris the truffles, Parma ham, and cheeses of their native Emilia-Romagna (Italy’s gastronomic heartland), while also mastering French cuisine. 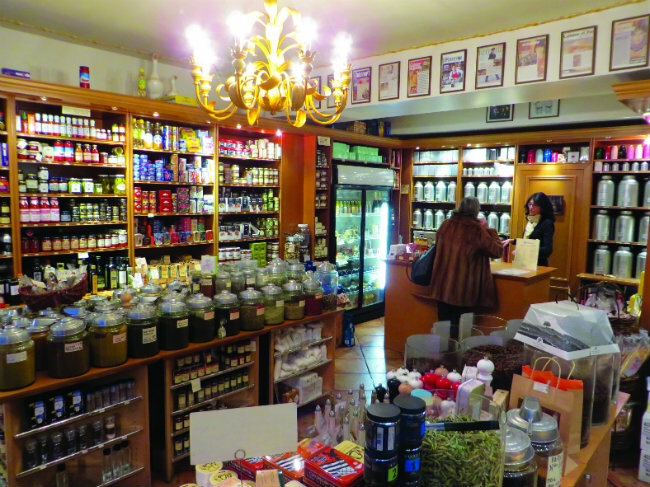 Many critics consider Davoli’s Alsatian sauerkraut the best in Paris! 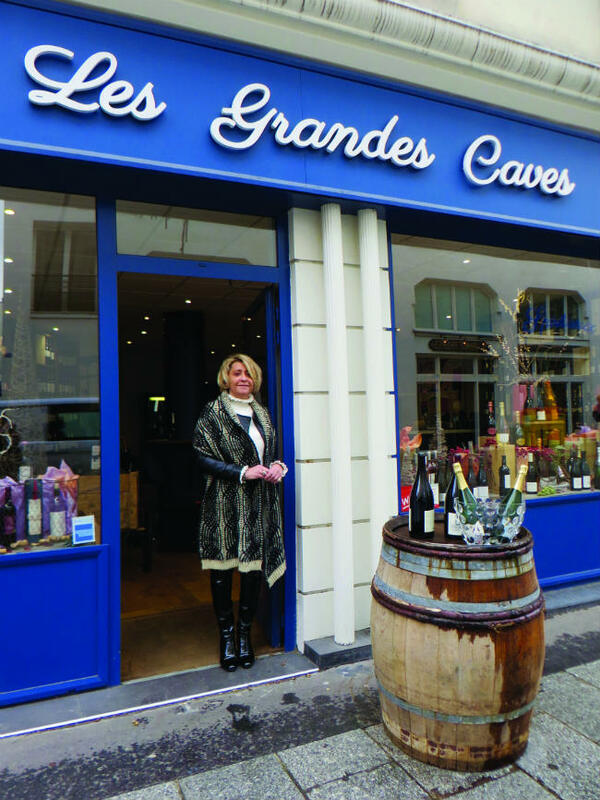 This petite boutique offers gourmets a chance to taste the ice creams, cakes and sorbets of Martine Lambert, Normandy’s so-called “Ice Cream Queen”. Astounding sorbets of just perfectly-ripe fruit and sugar, glaces of Normandy cream, fresh eggs, and divine flavours… Order a cone, or take away a pint, Lambert’s exquisite creations are unpasteurized and without preservatives. Which is the best épicerie fine, or gourmet grocer, in Paris? For the 2017 Guide des Gourmands, it’s the one Pascal and Nathalie Mièvre created in 1999 just off Rue Cler. From their canned sardines in lobster oil, to their piquillo pepper foie gras and their cep and smoked-tea mustard, their shop is a model of impeccable sourcing. Ever wonder where the president gets his cheese? Appointed supplier of the Élysée Palace is one of Marie-Anne Cantin’s many honours, as a guardian of gastronomic tradition and one of the last few Parisian fromagers to still age their cheeses to perfection in on-site cellars. Chef David Rosengarten calls Cantin’s jewellery box boutique a “tidy, super-aromatic cheese fantasy”. Rue Cler’s latest gourmet shop is dedicated to a legendary French speciality: Chantilly, the sweetened whipped cream named for the eponymous Château. Made at a farm in the Cantal region, and pasteurised at low temperatures to preserve aromas, the Maison’s dense, flavourful whipped cream is served with coffee, fruit, or transformed into candies, pastries and savouries. 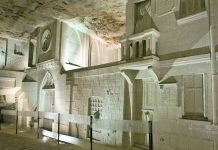 Les Grandes Caves offers a plethora of wines for the most discerning epicures, from illustrious names (Burgundy’s Domaine de la Romanée-Conti, the Loire’s Didier Dagueneau, the Rhône’s Jean-Louis Chave) to avant-garde stars like Château Bellevue, a biodynamic Grand Cru Saint-Émilion, and Roses de Jeanne, among Champagne’s smallest, most uncompromising estates. 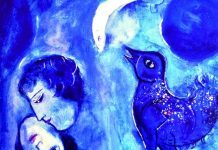 Previous articleLe Dernier Mot: The Sky is Falling! 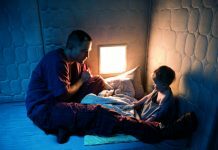 This was a great article. I remember when rue Cler was NOT a pedestrian street and what difficulty it was to navigate your shopping amidst all the cars making deliveries. Rue Cler has developed into much more than a shopping street however and is always a bustling spot for meeting friends and having good meals which don’t break the bank. 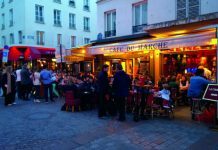 The Cafe du Marche is one of them (on the corner of rue Cler and Champs du Mars) as well as its counterpart, Le Comptoir, at the avenue de la Motte Piquet end of the street. Last summer I introduced many of my friends and family to this lovely street during our wedding celebration week. 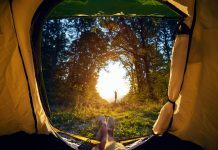 Rick Steves isn’t the only one taken by this lively “endoit”. It’s become my neighborhood too!! I live in England but like to go to Paris once a year if I can .I usually visit with my sister and we always make our way to Rue Cler at least once during our trip. We eat at café Marche and like to soak up the atmosphere. Rue St Dominique is very similar. 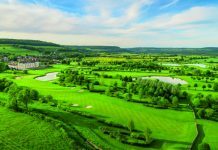 It’s true what the article says it does have a village feel to it.